Japanese people are very hard working and clever. And most of us acknowledge this fact. Their learning too is different than conventional method taught today in other parts of the world.Many educators from the west have known this powerful content of their teaching methods and started to translate their books. As a result, this powerful and easy technique of multiplication took the world by storm especially in the US and European countries. 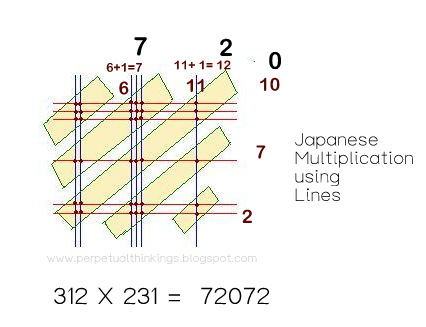 Most of the Japanese learning involves basic shapes and quantitative analysis skill to solve the problem.And after having crossed one such method, I couldn't help but make it a valuable post on my blog under the Maths is Fun section.The below images will teach you Multiplications using Lines or Japanese multiplication method taught for school kids in Japan. Both explanation and detailed video (see below) will give you more insight to this method. Note : The above image depicts the digits of the multipliers as horizontal and vertical lines. 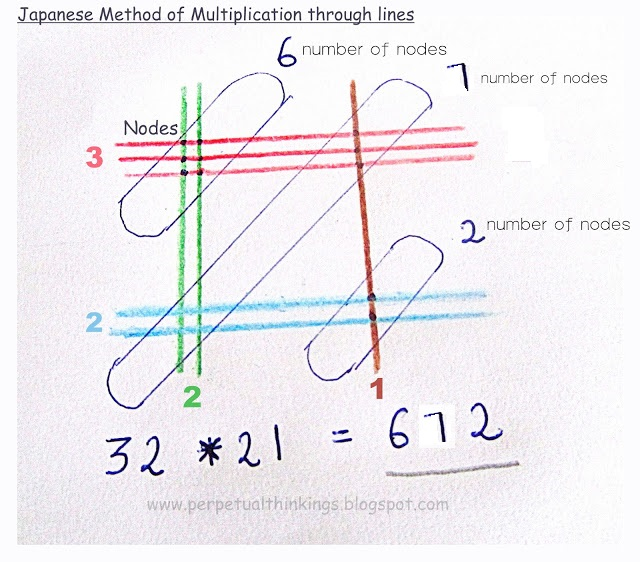 The number of nodes represents a part of the answer. Finally , accumulating all the nodes (numbers), we get the final answer. If you love the above Japanese Multiplication method , then you might also like Vedic Maths, a system of learning and working Maths problems at ease. I love this method. Has helped me out a lot and fast to. I have taught my 6 yr old how to check her math school wrk sheets on her missed problems. It's wonderful.